I call them an Oreo pancake, while another said they were more like an Oreo donut. Can we just agree to call them tasty? I scaled back the original recipe -- This will be good for (I am guessing) about 12 Oreos. Eat these with caution! As I found out, too many will make you sick. I would plan on 2-3 per person to be safe. 1. Preheat deep fryer to 375 f degrees. Combine pancake mix, milk, eggs and oil. Mix until there are no lumps. Chill in fridge, covered, for 30 minutes. 3. Drain on paper towels for a minute, dust with powdered sugar and eat while still warm -- don't let them get cold or they are gross! 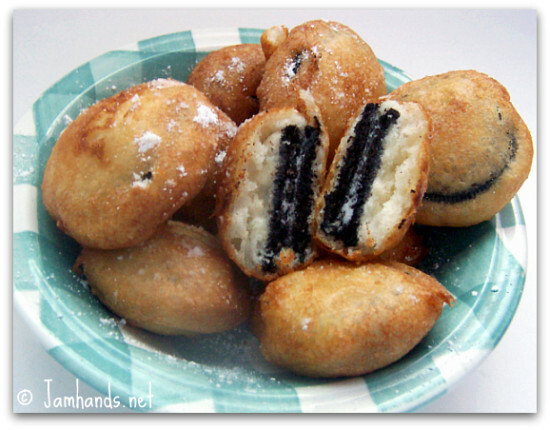 Fried Oreos! What a brilliant idea! My mom makes these, but uses Trader Joe's canned biscuits instead of making the batter. Think I'll ask her to try your recipe next time. Oh - and they're extra tasty with Peppermint cookies too! @ Emily - I bet the peppermint cookie tastes great.